After Saturday’s limited playoff schedule all four Cuban League series now boast a clear leader. Las Tunas (rained out of their first road match with Ciego de Avila) maintains a two-game edge over the winless Tigers while Villa Clara, Industriales and Sancti Spíritus are all now leading by precarious 2-1 margins. The two Occidental League squads earned their advantages on Friday with nail-biting victories that featured some clutch early-inning slugging by the Blue Lions and another strong starting pitching effort for the Gallos contingent. Player of the Day: Andy Sarduy drove home two and scored the game-winner as Villa Clara moved ahead of Granma in the Oriental League. Industriales held on to survive their first road game at Cienfuegos by pounding out 16 hits overall and plating eight runs in the first three frames on route to a 10-8 victory over the host Elephants. The two clubs employed nine different pitchers in a wild game that saw Alex Mayeta and Yasmani Tomás homer for the winners and José Dariel Abreu also go deep in a losing cause for the hosts. The Gallos squeaked out a tense extra-inning win over Matanzas that ended in dramatic fashion: a walk-off tenth-inning single by Yunier Mendoza plated Yulieski Gourriel with the victory margin. Gallos starter Noelvis Hernández coasted into the ninth frame with a 3-0 advantage before Matanzas rallied to knot the game and send it to extra innings. Although Cuba plays with the game-shortening IBAF extra-inning tiebreaker rule during the regular season, post-season games to not employ the controversial “Schiller Rule” scenario that places runners on first and second to start each extra frame. Saturday’s planned four-game schedule was largely obliterated by weather with three games rained out in Cienfuegos, Sancti Spíritus and Ciego de Avila (all central region provinces). The lone contest played was staged on the far eastern end of the island in Bayamao (Granma) where the host Stallions fell in extra frames and thus dropped one game back of Villa Clara. The home club once again revealed its debilitating imbalance (strong offense and weak defense) with key slugging from Despaigne (3 RBI on the strength of his second homer of the series) but also crucial defensive lapses (three errors) that in the end sabotaged a crucial game. Only two of Villa Clara’s runs in the 5-4 victory were earned (both knocked home by second baseman Andy Sarduy). 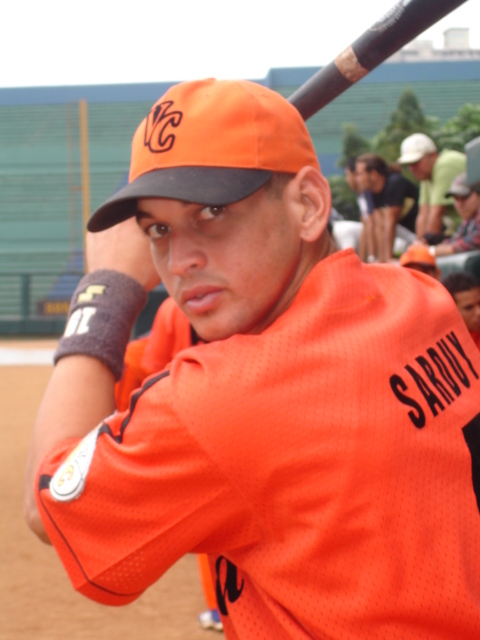 The game ended in the eleventh frame when Sarduy doubled for the Orangemen and eventually scored the game-winner as a result of consecutive errors by Despaigne and pitcher Alberto Soto. It has also now been announced by the Federation that games original announced for Tuesday, May 1 (the two matches in the Occidental League) will not actually be played on the date, due to the special May Day workers holiday celebrations.